How many ways can you describe the same place? Celestino Deleyto and Gemma López look at facets of how Barcelona is represented and experienced, focussing on two relatively recent films that take the city as a driving force of their narrative: Woody Allen’s Vicky Cristina Barcelona (2008), and Alejandro González Iñárritu’s Biutiful (2010). Though shot in the same location, these films depict entirely different worlds. At the end of their paper, Deleyto and López reference Italo Calvino’s Invisible Cities, in which the explorer Marco Polo describes a succession of fantastical, newly discovered cities to Kublai Kahn, all of which are, in fact, Venice. This reference is particularly apt, as at the heart of these two films are the sharply disparate experiences of new arrivals. 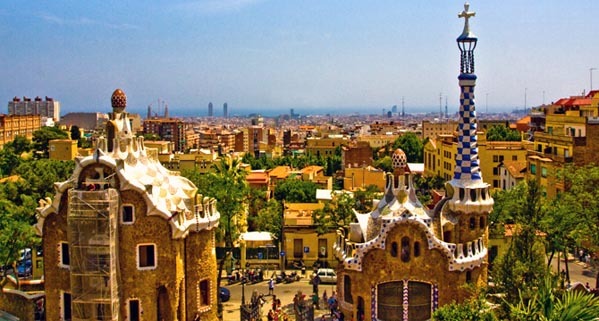 Barcelona, like any major international metropolis, is a vastly different place for tourists—who are seduced, coddled, and desired—than it is for largely impoverished immigrants who are generally marginalised and increasingly met with animosity throughout Europe. More recently, [anthropologist] Manuel Delgado has complained that the city has become a model, an example for urban planners and architects around the world to imitate, a paradigm of growth and harmony; but also a model in the sense of top model – a person who has been trained to remain permanently attractive and alluring. At [a recent] meeting with the mayor, one of the most controversial issues was the problem of shopping for groceries: both nearby markets have become popular tourist enclaves which sell products designed exclusively for tourists. Today, at the Rambla del Raval, the casual visitor may see an old building beautifully decorated by squatters opposite the luxury hotel; Pakistani children playing baseball in front of the same hotel’s main entrance while groups of undocumented African citizens hover around; a homeless woman sleeping under the enormous Pedro Botero Cat sculpture in the middle of the promenade; curious passers-by stopping in front of construction sites, mixed with the local prostitutes displaying their wares and sizing up potential customers; all surrounded by banners hanging from numerous flats demanding dignity for the neighbourhood. Taken together, they constitute a privileged diptych of the successful projection of the Barcelona trademark as a global, transnational city and provide a joint map of an imagined yet familiar city. They make spectators aware of the generally invisible, but sometimes very visible, borders that such phenomena as globalization, gentrification, immigration and tourism create inside cities. VCB follows two American tourists, Christina (Scarlett Johansson) and Vicky (Rebecca Hall) through romantic encounters with a local artist, Juan Antonio (Javier Bardem), as well as, once, with his ex-wife, María Elena (Penélope Cruz). Their Barcelona is, “A clean combination of architectural landmarks, sunny street markets, designer shops and restaurants and trendy contemporary art forms, a Barcelona which comes close to the trademark imagined and promoted by local and regional authorities and built by global capital.” Despite having two main Spanish characters, VCB, the authors state, is a film about middle-class Americans, for middle class Americans. The main character of Biutiful is Uxbal: “An ambiguous and multifaceted character, Uxbal is, at once, the affectionate single father of two children, a middleman who does business with illegal immigrants, and a spiritual medium for the recently bereaved.” The film was shot in the “underworld” of the densely populated peripheral towns into which Barcelona’s lower economic brackets have been pushed; its plot turns on Uxbal’s discovery that he has terminal cancer. For them, gentrification and globalization produce certain urban designs but the dynamics created by these transformations do not always reproduce what was originally intended by those in control, and the outcomes may be surprising. These authors point to the micro-level of the global city, that which is inhabited by human beings rather than by powerful corporations and movements of capital in virtual space. While the characters of VCB and Biutiful never meet, they all appear fascinated by the energy irradiating from the invisible barriers erected between them, and fascinate us, in their turn, with the stubbornness of their negotiations of the borderlands from which they derive their identities and inform their most intimate encounters. Celestino Deleyto is Professor of English Literature and Film at the University of Zaragoza. He belongs to the research group ‘Cinema, Culture and Society’ and is currently working on the Project ‘Humpty Dumpty on the wall: Transnationalism and the border in contemporary cinema’. He is the author of The Secret Life of Romantic Comedy (Manchester University Press, 2009) and co-author, with María del Mar Azcona, of Alejandro González Iñárritu (The University of Illinois Press, 2010). Gemma López teaches English Literature at the University of Barcelona. She is currently working on the project ‘Humpty Dumpty on the wall: Transnationalism and the border in contemporary cinema’. She is the author of Seductions in Narrative: Subjectivity and Desire in the Works of Angela Carter and Jeanette Winterson (New York: Cambria Press, 2007). Transnational Cinemas has emerged in response to a shift in global film cultures and how we understand them. Dynamic new industrial and textual practices are being established throughout the world and the academic community is responding. Transnational Cinemas aims to break down traditional geographical divisions and welcomes submissions that reflect the changing nature of global filmmaking.